As 9/11 is a black letter day in American calendar, the date 26/11 can be also described as the black letter day in Indian history. A series of terrorist attacks of November 26, 2008, had literally shaken the whole Mumbai city. The Mumbai attack 2008 had taken place in the elite corner of the city, in the prime locations like Oberoi Trident, Taj Mahal Palace and Tower and the very crowded Chhatrapati Shivaji Terminus of South Mumbai. Thousands of innocent lives got destroyed by these attacks and millions of lives would have been lost if the Mumbai Police and the National Security Guards (NSG) had not eliminated the terrorists from the attacked sites. The Mumbai attack 2008 had started from the Chhatrapati Shivaji Terminus (CST) of the South Mumbai. The Terrorists had said to be arrived by the speedboat in the docks near Colaba. Although the local police had been reported by the Marathi fishermen, they were unable to stop the attacks on time. After a heavy bombing at the station, two of the terrorists went to the Cama Hospital, intending to kill the patients. With the efficiency of the hospital staffs, they were unable to enter the hospital. Later, with the encounter of the police one of the terrorists were killed and the only survivor Ajmal Kasab got arrested. The attacks continued at a local café named Leopold Café. The gunmen killed around 10 people present in that café including some of the foreigners. Two bombs were set on the local taxis. The explosion had taken place near Vile Parle, Wadi Bunde, which had resulted in the death of the passengers and the drivers. The attacks continued at the renowned hotels Taj Mahal Palace & Tower and the Oberoi Trident. Bomb explosions and the gunshots by the terrorists had killed some of the guests. Later, some of the guests were held hostages in the Taj hotel. Another important place, the Jewish quarter of Colaba named Nariman House was attracted by the terrorists and the people were held hostages. With the help of NSG, the Mumbai Police executed the whole rescue operations and all terrorists were killed by 29th November morning. Only the terrorist named Ajmal Kasab was alive and got arrested by the authorities. This brave officer was the Chief of Mumbai Anti-Terrorist Squad. In that day, after he was informed about the attack, he first went to the Chhatrapati Shivaji Terminus. Later, he was informed about the movement of terrorists towards the Cama and Albless Hospital. The encounter with Ajmal Kasab and his companion Ismail Khan was very difficult. He died from the gunshot by Ismail Khan, later khan was also killed and Kasab was captured. Tukaram Omble was an ASI of Mumbai Police. He was the part of the encounter of Ajmal Kasab and Ismail Khan. He was said to be the one to capture the terrorist named Kasab. Omble held on to the rifle of Kasab while he continued shooting, giving the other inspectors to arrest him. He died by the gunshot of Kasav. Ashok Kamte was Additional Commissioner of Mumbai Police. He was also killed in the encounter near Cama and Albless Hospital. 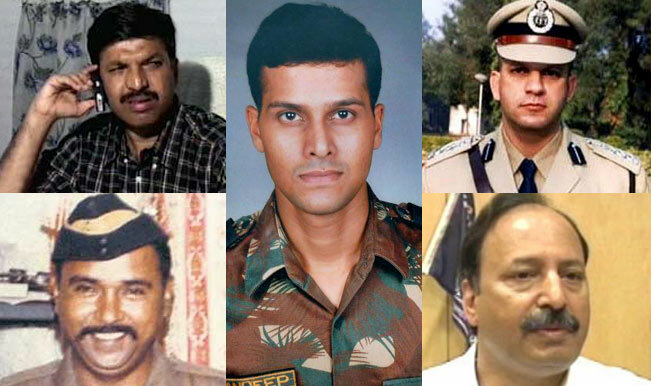 Major Sandeep Unnikrishnan was the officer of Indian Army. During the Mumbai attack 2008, he led the group of commandos to Taj Hotel in order to free the hostages. Apart from freeing the hostages, he also saved his injured colleague and led him to safety. He was shot from the back. The major efficiency and sacrifice of the Mumbai Police and NSG commanders only saved the life of thousands of innocents during the Mumbai attack 2008. No matter how many awards were dedicated to them, their courage and determinations cannot be measured in any terms.